This wall chart is a comprehensive visual map of the resonator guitar (round and square neck). It includes a large diagram of the instrument and detailed views of its parts. The chart includes the different types of resonator and neck designs, providing a complete anatomy of the instrument for bottleneck and lap style playing. 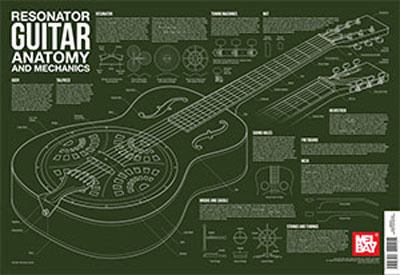 This poster is a great visual for anyone interested in the resonator guitar.